Nestled in the center of Amritsar city, Qila Gobindgarh has been witness to Punjab’s valiant history. Originally Built by Gujjar Singh Bhangi, a local chieftain, the Qila gained prominence when Maharaja Ranjit Singh conquered it and renamed it after the 10th Sikh guru, Guru Gobind Singh. He strengthened the fort by building moats and gates as part of military defense against invaders who attacked the city of Amritsar to loot and plunder. Qila Gobindgarh is also known for being home to arguably the most famous diamond of the world, the koh-i-noor. It is believed that Maharaja Ranjit Singh kept his treasures at the Toshakhana which included this famous gem. Today, Qila Gobindgarh is a lively and unique museum that pays homage to Punjab’s history and culture. On exhibit is a 7D show based on the life of Maharaja Ranjit Singh, a coin museum in the erstwhile Toshakhana, an ancient warfare museum and a unique show using projection mapping technology. 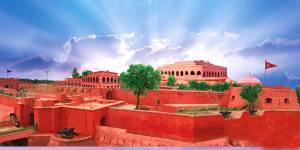 Historic Qila Gobindgarh will host The Heritage Cuisine Summit and Food Festival. Come October, its sprawling spaces will see an eclectic mix of food professionals and food lovers come together to celebrate food as heritage. As chefs from around the world bring their food, history and culture to the table, they along with other national and international guests will get a chance to savor a slice of Punjab’s remarkable history at this memorable venue. Rocky and Mayur are coming to town!